Moving an entire company is an art in itself. Even more than for private removals, it’s all about organising and a meticulous planning. For non-Dutch speaking customers, Henneken will arrange for employees who understand and speak English. All our employees wear similar company outfits for easy identification. Besides, various employees have completed a dedicated “Art Handler” training course for the removal of antique items. The removal vans we use are modern, fully sealed and air suspended, meeting all regulatory and environmental requirements. For a smooth removal, a damage-free transfer of inventory and to meet occupational health and safety requirements, Henneken uses modern and efficient tools such as removal elevators, various types of rolling containers, furniture rollers, computer boxes and archive trolleys. 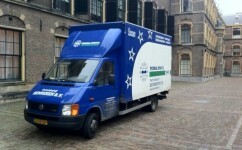 As the removal service par excellence Henneken aims to unburden the customer throughout the moving process. We will guide you to make the process run as smoothly as possible and to help you avoid any pitfalls. With Henneken you can rest assured that your company’s move will be a success.